Home / Skincare / Want pretty pink lips? Or looking to lighten dark lips? Imagine if you could just dab a bit of transparent gloss on your lips and be out of the door, looking perfect? Or if your lip color did not show through lipsticks and change their hue? Or if you woke up looking gorgeously kissable? All this can happen only when you have naturally pink, rosy, supple lips that seem to glow from the inside. Unfortunately, that’s easier said than done since lips, after all, are part of the skin and there are many things that can cause them to go darker, including sun exposure, pollution, diet, ageing, hormonal changes, pH imbalances, allergies, illness or even stress. And, like skin, they need to be nurtured with a 3-step prep-treat-shield routine. So, here’s how to lighten dark lips – quickly and naturally. Exfoliation removes dead skin cells, thereby allowing moisture and lip lightening treatments to penetrate quickly and deeply. Scrub your lips 2-3 times a week and follow up with a dab of olive oil or a lip balm if you are not applying a lip mask immediately afterwards. Slather lips with Vaseline, then gently scrub them with a soft-bristle toothbrush using gentle, circular movements. Rinse with warm water. Mix together 1 teaspoon each of honey and baking soda. Apply the mixture on your lips; leave it on for a few minutes then gently rub to remove dead skin. Mix a small amount of coarse sugar with a few drops of water. Apply the mixture onto lips and rub it in circular motions. Wash off with lukewarm water. 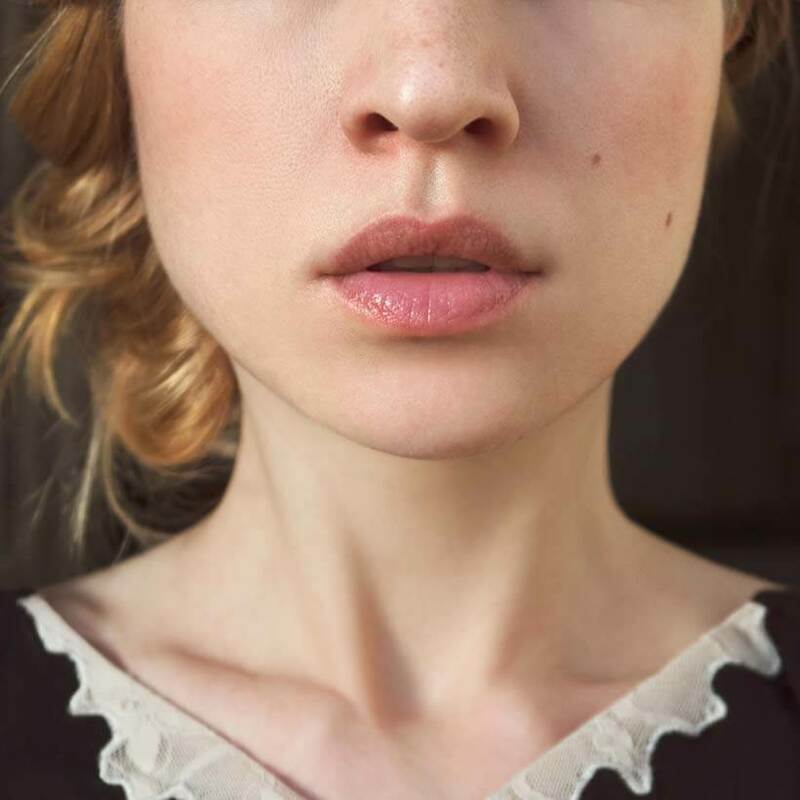 The skin of our lip has only 3-5 cellular layers, making it extremely delicate. Plus, lips don’t have any oil producing glands and therefore tend to dry out faster. So, they need constant nurturing. Lemon juice lightens skin and busts dead cells. Use its natural potency to lighten dark lips by making a “lip mask”: mix equal parts of honey, yogurt and lemon juice into a thick paste. Apply the paste to your lips and leave on for at least an hour. Then scrub it off using warm water and circular movements of your fingertips. The lactic acid in milk is one of the most potent (yet gentle) skin lightening ingredients. Apply a few drops on a cotton pad and place on your lips; leave overnight and wash off in the morning. Crush 4-5 clean rose petals and mix them with enough honey to make a paste. Apply this paste on your lips twice a day; there is no need to rinse it off. The combination of skin softening honey and color restoring rose petals makes for a superb treatment to lighten dark lips. The skin of our lips has no natural protection, which means that we need to take extra care to keep them plump, rosy and healthy. Keep your lips soft, supple and hydrated by moisturising them with balms containing conditioners like aloe vera, vitamins A and E, and cocoa butter. Some terrific ones: Fresh Sugar Lip Treatment (my personal fave! ), Glossier Universal Skin Salve and L’Occitane Roses et Reines. For the daytime, choose balms with an SPF of at least 15, since lips have no natural sun protection and are hence extremely prone to hyper-pigmentation. Top picks: Moroccanoil Lip Balm SPF 20 and Supergoop! AcaiFusion Lip Balm SPF 30 . Remember, smoking not only dries the lips, it also reduces oxygen supply to the lip skin which provides the essential nutrient to blood cells. Ditto for excessive coffee, tea and alcohol, which cause dehydration. Keep your lips hydrated by drinking sufficient amounts of water. Foods rich in Vitamin E help keep lips soft and supple. So always make fruits and vegetables your first choice. What do you gals think of these tips? Do you abide by them during the chilly lip chapping season? Discuss! « And The Beauty Gypsy is back! Same question, do we have to follow all steps listed? Thank you. Great information. I’m not sure if my lip is naturally dark, but my lip is not entirely dark. My upper lip is dark but my bottom lip only dark at the egde. It soooo annoying having this kind of lips because it looks so horrible and drop down my self-esteem. Can those remedies work on me?? Did this end up working for you? I have the same thing — upper lip and only edges of lower lip are dark, so I don’t want to lighten the whole thing. Was wondering if you were successful in achieving one tone as opposed to two toned lips. This is great information! Most people don’t realize that the skin of the lips is so delicate and has no natural oils to it. Then they complain when they have dry chapped lips. I tell my clients to make a paste from olive oil and sugar and buff them, then to massage a few drops of vitamin E (a powerful antioxidant that helps prevent and soften fine lines around the lips) and top with a thick coat of vasaline at night before bed. Helps exfoliate and stimulate circulation. Also a great trick to do to naturally plump up lips before applying lipstick. Just do it before you start your makeup and then wipe the vaseline off before applying lipstick to keep it from feathering. my lips have gone Damn dark.so.I do trust your remedies and gonna check then out…!.thanks and if you don’t mind will you please send me some more natural beauty ways to lighten up my skin.! through emails! I’m Tired of Cutting the Upper layer of My Bottom Lip. How to avoid it ? Best Article thanks for sharing. hey……….thank u for these tips to improve darken and dry lips, i have dark and dry lips, i gonna try these tips for sure. I’m not only going to talk about lips themselves but hair and skin.QUIT EXPENSIVE PRODUCTS! For your hair use an egg , avocado ,olive oil and flour mask once a week ,and use castor oil to style your hair.Trust me ,you will get amazing results! For your skin, in terms of lightening or whitening ,use an equal amount of lemon and water and dip a cotton pad Into it,rub all around your face and neck (or hands and arms) using circular movements and rinse with lukewarm water .use a tomato puree mask straight after. Do both of these just before you sleep ,not at daytime or you will face unpleasant results.The best advice you could get in terms of lip care is above so use it.I have done all of this and I can’t describe how effective it is.It works! Nicole are you from Goa ? My natural lips are like purple. I do not smoke but it looks as if i do. Would this work ?